I'm so excited to announce that I've been blessed with the opportunity to give one of my readers the entire Prismatic Collection by China Glaze! This collection consists of the six polishes: Full Spectrum, Liquid Crystal, Optical Illusion, Polarized, Prism, and Ray-diant. I personally have this collection myself, and it's awesome! -This ends on May 25th at 11:59 PM CST. Happy Administrative Professionals Day! Today, I have some swatches of China Glaze's Grape Juice to share with you all! Grape Juice is from China Glaze's 2009 Summer Days collection. I would describe this polish as a medium violet color with silver flecks in it. To be honest, I don't think that I'm that crazy about this shade of purple. I'm a big fan of purple polishes, but for some reason this one just seems blah to me. This applied great! The formula wasn't too thick or too thin and it went on really smooth. The only negative thing I noticed about this is that it took a little bit longer to dry than most polishes, even with my fast dry top coat. 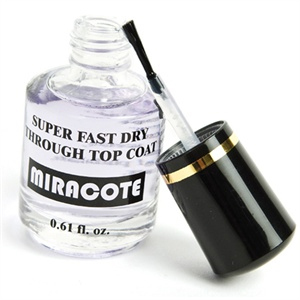 Miracote seriously makes my nails amazingly shiny! You could probably look back at some of my posts from the past few months and notice this. The only other product that I've found to make my nails even some what as shiny is Sally Hansen's Insta-Dri, but that shine has a slight yellow tint to it in some lighting, which I really don't like. My nails are always completely dry within two minutes! It doesn't bubble! A few of the other top coats I've used would bubble really easily if I accidentally put too much on. (Ex: Out the Door and Sally Hansen Insta-Dri) I've been using Miracote for about 10 months now, and I have not experienced any bubbling due to my top coat. There's absolutely no shrinkage! For awhile, I was really into Seche Vite, but it caused quite a bit of shrinkage with a lot of my polishes. Miracote doesn't do this! This doesn't cause any yellowing of the nails! You don't need any thinner to keep this at it's original consistency! The most important aspect of a top coat, in my opinion, is that it prevents chipping. I wore this on a 10-day vacation last June, where I didn't change my polish once. During that trip, my nails only started chipping on the last day. The only negative that I can find to Miracote is that you do have to use two coats of it in order to prevent chipping. Cost: This usually costs about $6-7 for .61oz, which is really good since most products only contain .5 oz. I just have a really quick post with some swatches of China Glaze's Optical Illusion for you all tonight! Opitical Illusion is one of the six polishes from China Glaze's Prismatic Collection. Optical Illusion is an awesome teal glitter with a mixture of large and small pieces of multi-colored glitter. This applied great and was completely opaque in three coats, which I think is pretty good for a glitter polish. The only negative to this one is that it chipped a lot the first day I wore it. This drove me crazy, and I actually found myself at my desk at work today repainting my nails so they looked at least somewhat decent. I hope you've all been having a great weekend so far! Tonight, I have some swatches of Sally Hansen's Something New from the Diamond Strength line to share with you all! Something New is a really pretty coral color that pretty much looks like the color of a grapefruit. I've had some problems with the Diamond Strength polishes in the past, but I was actually really impressed with this one. It applied really smooth and even, and it ended up taking me three coats to reach full opacity. Tonight, I have some swatches of Revlon's Sheer Cotton to share with you all! I would describe Sheer Cotton as a really light cream with a slight hint of pink to it. I absolutely love this color! While the color is awesome, the formula is not. This applied really streaky and ended up bubbling a ton. I've found that most Revlon polishes have this problem, but I keep buying them because I'm usually able to find them on clearance for $1 and the colors tend to be really pretty. If any of you know of a polish that's this same color that has a better formula, let me know! Sorry for being absent for so long! I've been super busy with my internship, have been looking for another job, and ended up having the flu for three days. Fortunately, I'm feeling much better, and I found a new job that I'm starting next week! Since things are starting to settle down a little bit, I'm hoping to be more consistent with my posts and will be getting back to my Monday, Wednesday, Friday, Saturday schedule. Today, I have some swatches of Zoya's Crystal to share with you all! I would describe Crystal as an aqua blue foil with chunky gold glitter. The gold glitter makes this polish really unique and it's unlike any of the other blues that I own. The formula for this one was a little bit thin, but it still applied really smooth. I used three coats.